The Program Management team at Column5 is dedicating to making sure your projects are delivered as efficiently as possible within budget. To help make the right decision for your project, it is important to look at what project management is, what benefits it provides, and how it fits in the overall project. 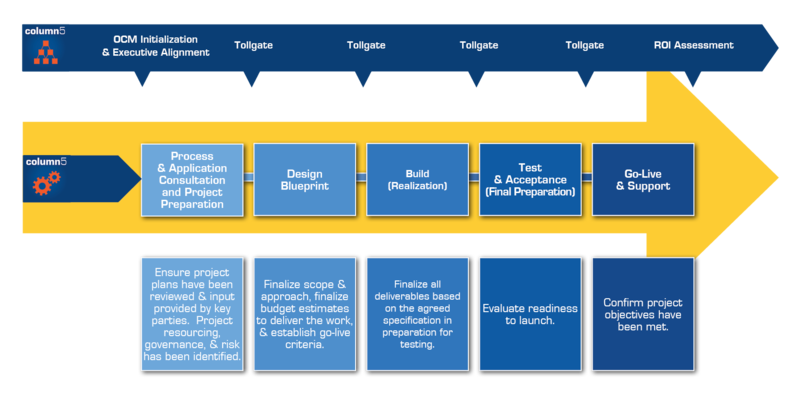 The Column5 implementation methodology for SAP BPC EPM projects has evolved based on the hundreds of successful EPM projects we have managed. The methodology includes an integrated plan incorporating the people-side of the change, leadership and sponsorship, and traditional project management. So, how can project management help keep your project on track? Project management follows a strict methodology that will allow the team to track every step of the project. Several methodologies also provide the flexibility to adapt to any particular project so it is not a one size fits all. All methodologies provide the structure that will lower the risk of failure or overage of your projects. The project plan that is provided through the project management methodology allows the team to anticipate potential issues and to be proactive in resolving them. Project Managers will work with the developers and combine previous experiences with the current projects to look into the future and identify potential risks that could be damaging to the project's success. For each identified risk, the project team will need to provide a solution, and this process is tracked throughout the duration of the project. Anticipating potential risks and issues, and tracking them provides the ability to proactively solve these issues as opposed to reacting to them at the time they occur. Reacting to an issue is damaging to the project because it is a distraction that often occurs at a critical time. Anticipation allows the team to prepare ahead of time and implement a solution quickly. Efficiency is key for the project's success because you want to stay within budget and timeline. You need to maximize the time available from each of your resources to achieve that goal. The project manager provides direction to the project team, and assigns clear tasks to the right person at the right time so that there is no idle time from anyone on the team. A project will only be successful if the product delivered works properly. A big part of the project plan focuses on quality throughout the project. The requirements need to be captured properly in order to move to the design phase. The design needs to be signed off before the development begins. The development consists of more than just building the tool. Testing throughout the development phase needs to be completed before the project moves to full testing and final delivery. These steps are clear in the different methodologies so if followed, the product will fulfill the quality requirements. A project is not successful unless the client is satisfied with the final product delivered. A successful project will be delivered on time, on budget, and per the requirements. Project management helps increase the success rate of the project thanks to it methodologies, which in turns helps increase the customer satisfaction. The project plan includes multiple check points and signoffs that keep the client's involvement at its highest and the more the client is involved throughout the project, the better. Project management will drive the project from beginning to end and provide guidance throughout. What Should an SAP BPC Implementation Team Look Like? "The Column5 Project Management team is wonderful to work with. They are very knowledgeable and provide exceptional support from the beginning to completion of each project. I have learned a lot from working with the Column5 PM team and as a result my Project Management skills have grown over the years. I look forward to working with the Column5 PM team on future projects."